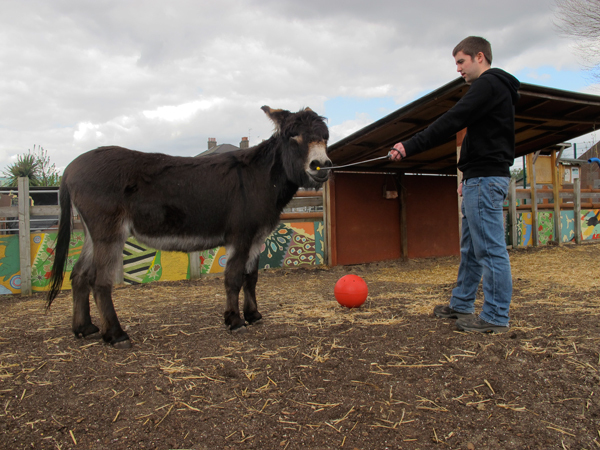 Today, Connor the animal behaviourist was at the farm doing clicker training with Derek the Donkey. Derek is a young donkey and was particularly skittish when he moved to Spitalfields. Connor has been working with him over the last year, using the technique to help Derek assimilate to his new surroundings, while also providing mental stimulation and exercise. Most commonly used with dogs and horses, clicker training shapes animal behaviour through positive reinforcement. As the animal performs the desired action, the clicker is pressed and the animal is given a reward, such as food. Soon the animal equates the sound of the click with the treat, and is encouraged to carry out the new behaviour. To further aid Derek’s desensitisation to unfamiliar sounds and objects, various colourful items have been placed around his paddock and stable – including an easel because Derek likes to paint. (More posts about this soon, I hope). Via these interactions, Derek has formed a close bond with Connor, and brays every time he arrives or leaves. I recorded one of his calls today, then, out of curiosity, played it back to him on a speaker. Derek became quickly excited, possibly distressed, before letting out the loudest, most animated ee-aw I’ve ever heard. Unfortunately, I did not record this one and didn’t have the heart to repeat the experiment. The noise of the clicker reminds me of the sound I intuitively mouthed when making my performance video She Wants It, She Wants It Not with Gina the Donkey in the Pyrenees some years ago. Gina was the guardian for a flock of sheep, and used to bray each time I called her name. 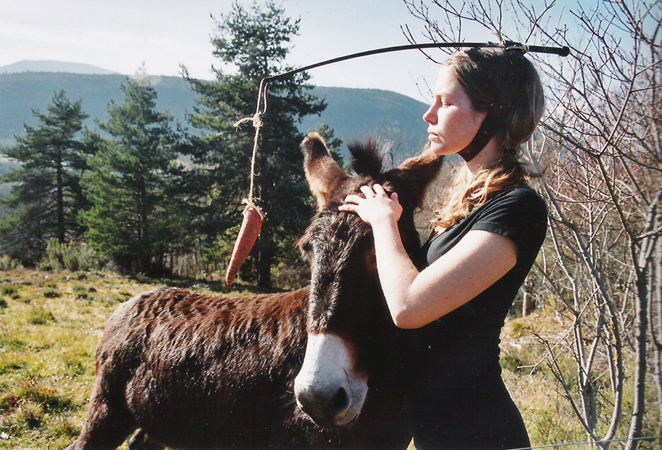 She epitomised donkey strength and pathos. I was very fond of her and, in an expression of empathy, I made a mask for myself in her image. 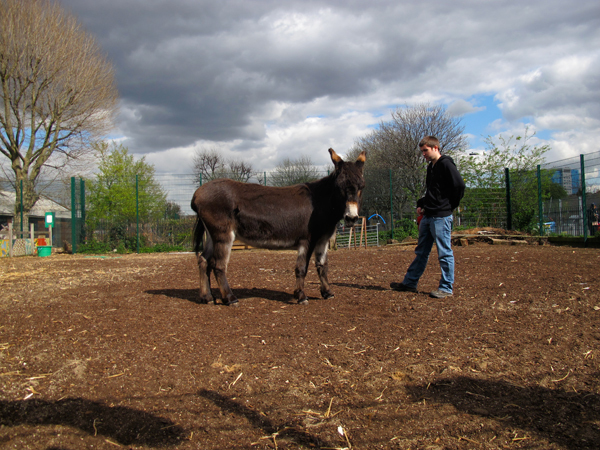 For live demonstrations of clicker training, equine hoof care and donkey rides, come down to the Spitalfields City Farm on Donkey Day, Wednesday 8 May, 12-3pm. This entry was posted in animal sounds, donkeys and tagged animal behaviour, clicker training, Donkey, Spitalfields City Farm by samanthasweeting. Bookmark the permalink.